I'm just loving a tartine lately. Maybe that's because I've just learned what one is - 'a French open-faced sandwich.' Oh, the possibilities. Lightly brush both sides of bread with olive oil and bake on a baking sheet until toasted, approximately 10-15 minutes. In a large skillet, heat a few tablespoons of olive oil over medium-high heat. Add sliced mushrooms and saute until slightly crisp and brown tossing occasionally. Season with salt and pepper and set aside. 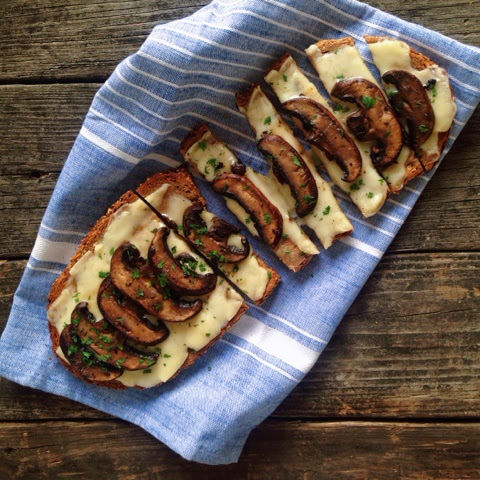 Top toasted bread with slices of Fontina cheese and return to oven until cheese is melted, approximately 3 minutes. Remove from oven and top with sauteed mushroom slices. Return to oven, for an additional 3 minutes until gooey and perfect. Garnish with finely chopped parsley. If desired, slice into little hors d'oeuvres-y sized pieces. Serve immediately.